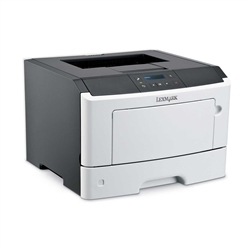 Lexmark MS415DN Mono Laser Printer features duplex printing, instant warm-up fuser, display panel, Ethernet, USB and parallel ports, plus options for wireless printing and higher input capacity. It's compact enough to fit anywhere. MS415dn include a keypad to ensure that only the person who sent the print job picks it up - whether sent from the next desk or the other side of the world. With MS415dn, you can print from any iOS or Android device with Lexmark Mobile Print. It's AirPrint-compatible, for easy wireless output from Apple OS X and iOS devices. I 800 MHz dual-core processor and 256MB of memory easily handle complex documents. App- and e-mail-based mobile printing provides you with remote printing options. Prints up to 40 ppm to generate documents quickly. Up to 1200 x 1200 dpi resolution for crisp images. Automatic double-sided printing helps you conserve paper. 2 paper trays offer a 300-sheet total capacity to handle complex print jobs. 80,000 sheet monthly volume. This unit ships with power cord only. Consumables and connectivity cables need to be purchased separately. 800 MHz dual-core processor and 256MB of memory easily handle complex documents. App- and e-mail-based mobile printing provides you with remote printing options. Prints up to 40 ppm to generate documents quickly. Up to 1200 x 1200 dpi resolution for crisp images. Automatic double-sided printing helps you conserve paper. 2 paper trays offer a 300-sheet total capacity to handle complex print jobs. 80,000 sheet monthly volume.